Moog Music was already there for you with modular products if you wanted to live out a Keith Emerson fantasy and had thousands of dollars burning a hole in your pocket. For some, that may read like learning the Learjet company is happy to indulge your dream of flying — so long as you’ve got a few million dollars and time for pilot lessons. Okay, so what about everyone else? Hot on the heels of the discontinuation of the Minimoog Voyager, the Mother-32 might just be Moog’s new answer to what synthesis lovers everywhere might crave. It’s a desktop (but also rack-able) semi-modular synth, and at just US$599. The Moog Mother-32 isn’t massively expensive. It doesn’t need other modules to go with it. (This is Moog’s long-awaited entry into Eurorack, in case you were wondering – but it also stands happily on its own.) It doesn’t even insist that you connect a single patch cord: it’s a very sensible semi-modular design, with loads of patching options when you like them, but also the ability to start making sound right away. So, if you have caught Eurorack fever, this will fit right in. But if you haven’t, it’s finally an instrument that brings back some of the appeal of semi-modular design. You combine that with a 32-point analog patchbay. Patchable, all the synth stuff you need, and the big surprise to me is that clever-looking step sequencer. It also looks beautiful, with black, laser-etched extruded aluminum and (it’s a Moog!) wooden sidepieces. 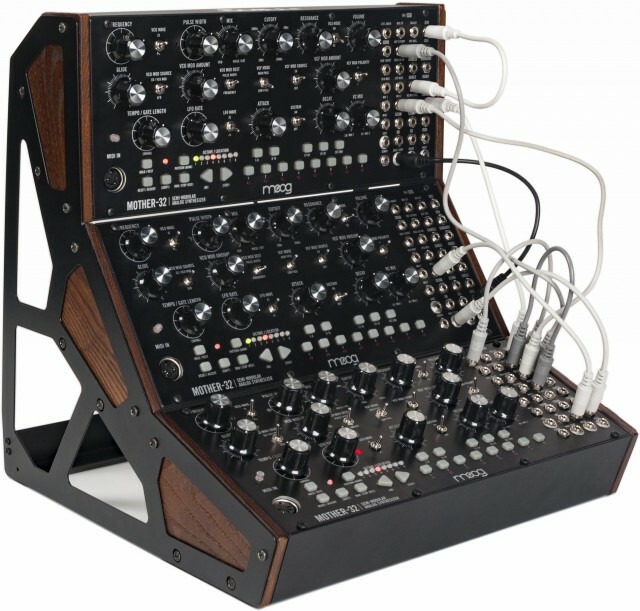 Moog is also fully accessorizing this, with 2- or 3-tier rack kits and a nice soft carry case. If you do want to use this as the beginning of a slow descent into the wallet-draining, life-destroying power of Eurorack – uh, I mean the “joys of modular synthesis” – there’s a 60 HP Eurorack case – power supply not included. There’s some worthy direct competition, too. For $899, you can pick up a Pittsburgh Modular system – and have free space to grow. On the other hand, it’s tough to beat Moog’s $599 price – and some will find the Moog character (in aesthetics, build, and sound) a big draw. And the combination of the Moog with that full spectrum of Eurorack will also clearly appeal to a lot of people. 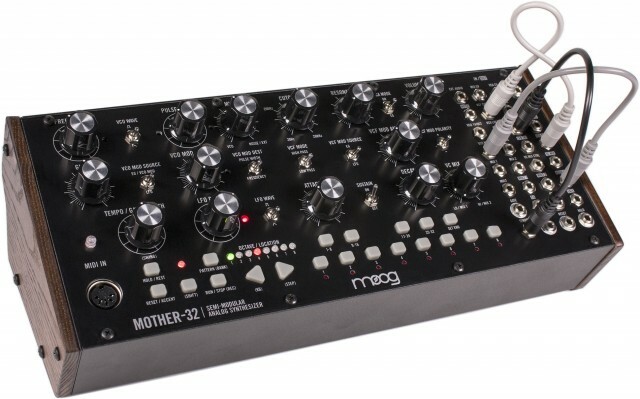 The MOTHER-32 is a semi-modular analog subtractive synthesizer very much inspired by the traditional Moog modular and the instruments we’ve developed over the last 50 (15) years. At it’s essence is a voltage-controlled, 1V/octave sawtooth analog oscillator with control-voltage summing and both linear and FM modulation inputs followed by a PWM comparator with voltage-controlled inputs. The oscillator and PWM engine is very much in the traditional of the Voyager and Little Phatty lineage. The Noise and LFO sections are both purely analog and again are very much in the vocabulary of our synthesizers. Analog mixers, analog envelope generator, VCA, MULTS, and as you mentioned a classic Moog 4-Pole Ladder filter with a very good sounding High-Pass configuration are all in the Moog vocabulary. Additionally, a very powerful STEP SEQUENCER / One-Octave keyboard is included in the instrument, making this a fantastic tool for creativity and spontaneous composition. As you know, the sequence also heralds directly back to the original modular systems but this modern incarnation, of course, includes MIDI syncing, memory and a much more sophisticated function set.